I adore potatoes. Even before I was following the low FODMAP diet, I ate potatoes several times a week, as they are my preferred starchy, carb-y food. I had been eating gluten-free for many years and potatoes of all sorts just fit into my life quite well. 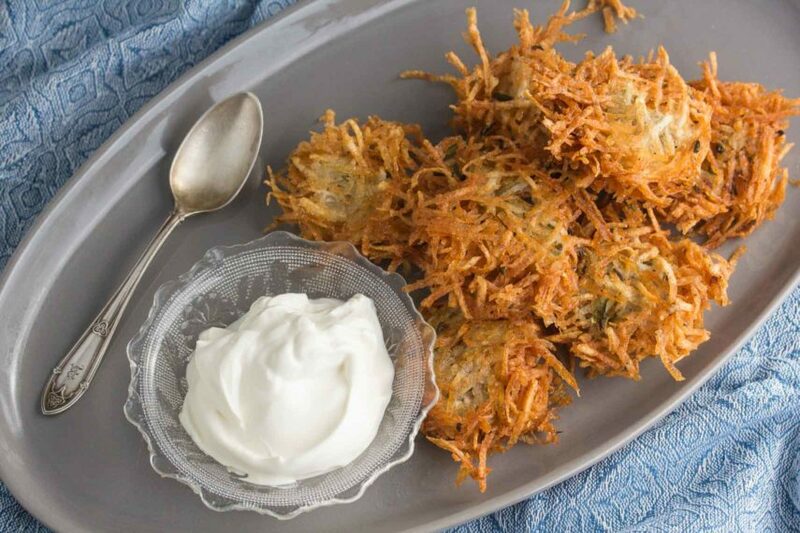 Latkes, the Jewish fried potato pancakes that are often made for Hanukkah, are crispy and crunchy and quite versatile. Latkes are associated with the celebration of Hanukkah (or Chanukah, depending on your spelling approach) as they are deep pan-fried in oil and it was a one-day amount of oil that ended up being able to light the Menorah for 8 days – the miracle that the Jewish faith celebrates. The holiday typically falls in late November to late December and is celebrated for 8 days, giving you plenty of time to eat latkes and/or fried jelly doughnuts! (And if you are looking for a holiday main dish, check out our Sweet & Sour Brisket with Red Wine, Grapes and Sweet Potatoes). Appetizer, Side Dish – or Breakfast? 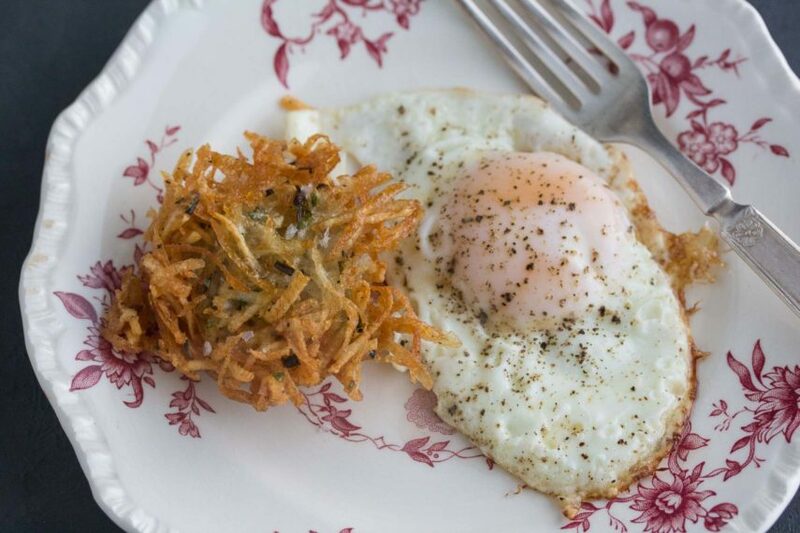 Latkes are versatile. You might think of them as a side dish, or a light meal along with the traditional accompaniments like applesauce (high FODMAP) and sour cream. They also work well, in a smaller size, as an appetizer. Try them topped with lactose-free sour cream, a small piece of smoked salmon and a spring of dill, for instance. And how about breakfast? As you can see in the images above and below, we enjoyed them post photo-shoot with a nice fried egg. There are different approaches to making latkes. This one here is pure potatoes, which yields a very crispy, crunchy lacy latke. Starchy russet potatoes are peeled, shredded and wrung dry. A little chopped scallion green, salt and pepper and they are ready for a dunk in hot oil. Don’t overlook the version with an extra sprinkle of salt, as seen below. Other approaches add egg and/or flour (gluten-free), as you will find in my version in The Low-FODMAP Diet Step by Step, my book co-authored with Kate Scarlata RDN (where they are called Potato Pancakes). The approach in the book is a bit more substantial and traditional. If you want to use the optional sour cream, search out a lactose-free version such as Green Valley Organics, which we love. You absolutely cannot tell the difference from conventional sour cream. 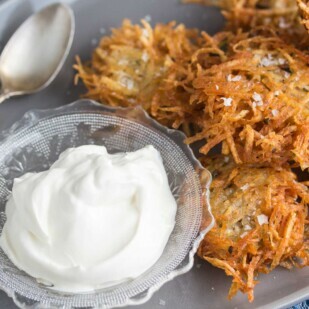 It is rich, smooth and creamy and complements the hot crunchy latkes really, really well. I greatly prefer latkes fresh out of the fryer. If you are going to make these once a year, make them as great as they can be. While you can hold them in the oven for a little while they will lose their crispness, which is a major part of their charm. My recommendation is to not hold them for more than 30 minutes. If they have really lost their oomph, run under the broiler on the rack for a minute or two – watch carefully for burning. These will be dairy-free if served without the lactose-free sour cream. 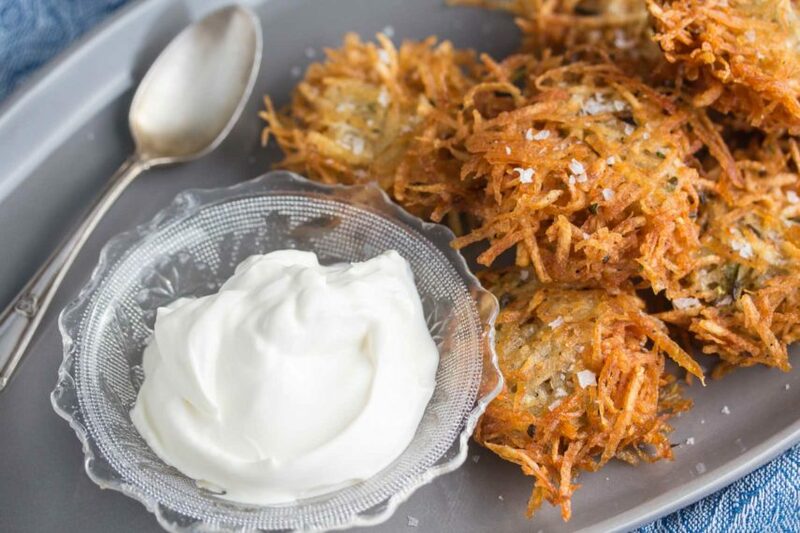 Latkes are crispy potato pancakes - perfect for a Hanukkah celebration or anytime you want a crispy, crunchy potato pancakes. Wash and dry the potatoes, peel, then coarsely grate on a box grater or use the shredding blade of a food processor. Squeeze as dry as possible. I suggest placing in a colander and using your hands to press down as hard as possible, draining away any liquid. Then use a clean kitchen towel or several layers of paper towels to wring the potatoes dry over the sink. You might have to change towels or paper towels a couple of times to get them really dry. 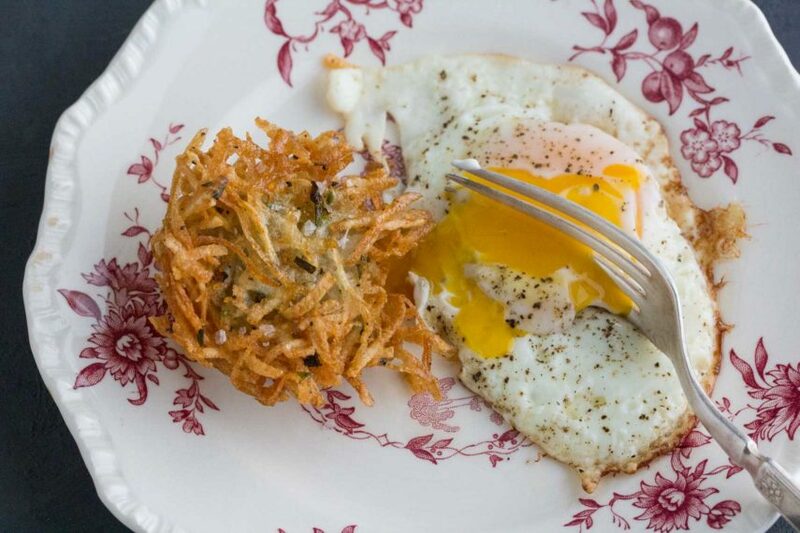 Don’t skip this step; it helps the latkes be as crisp as possible. Place dried grated potatoes in a large mixing bowl and stir in chopped scallions and season well with salt and pepper. Position rack in middle of oven. Preheat the oven to 300°F/150°C. Place a rack on a half sheet baking pan and set aside. Also have several layers of paper towels near the stove to receive the pancakes as they emerge from the oil. Heat about 2 inches (5 cm) of vegetable oil in a heavy straight-sided skillet over medium-high heat (do not use nonstick). Drop a few shreds of potato in the oil; they should sizzle. If you want to use a deep-fry thermometer, the oil should be about 350°F/180°C. Use a 1/4 cup (60 ml) measuring cup to scoop up potato mixture. Drop mound of potatoes in oil and immediately press down firmly with spatula. The latkes should be about 3 inches (7.5 cm) across. The number you can cook at a time depends on size of skillet; do not crowd them in the oil. Typically 3 or 4 at a time is a good number to keep track of. Fry until well browned and crisped on the bottom, about 2 to 3 minutes, adjusting the heat as necessary. Flip the pancakes over and cook on the second side until well browned and crispy. Drain on paper towels, then place on the prepared rack and keep warm in the oven as you fry the remaining latkes. Serve as soon as possible, with an optional sprinkle of flaked salt (my choice!) and/or also offering lactose-free sour cream, if desired.